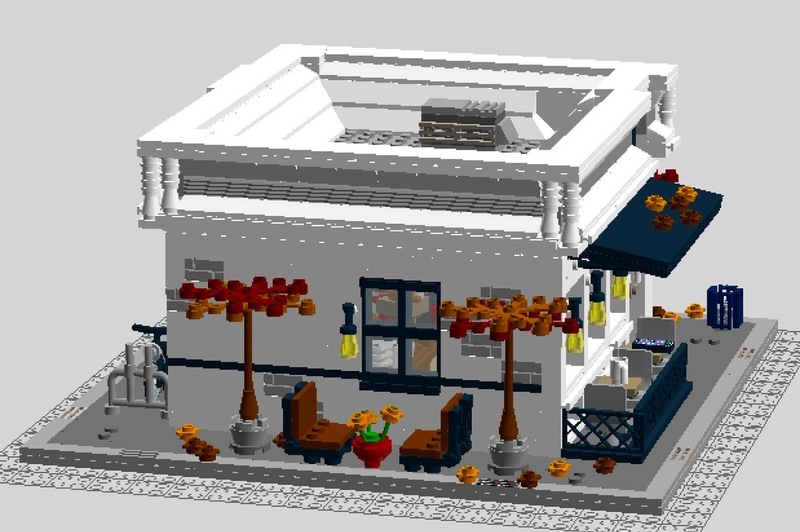 I have just finished the design of my latest custom LEGO build which I'm calling "Autumn Café" [now available to support on LEGO Ideas]. 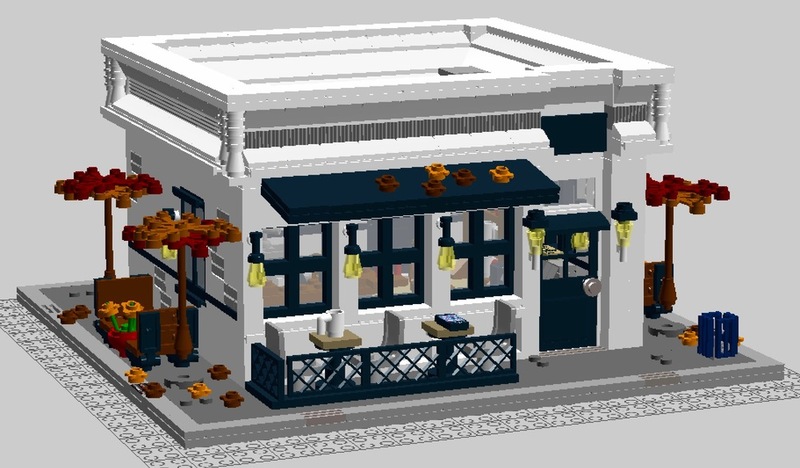 The design is inspired by various real cafés I've seen in the past and borrows elements from each of them to create one cohesive model. I decided on Autumn as the season because - as we all know - Fall is simply the best time of the year to cozy up in your local café with a warm cup of coffee or tea. The exterior of the design includes covered outdoor seating, trees with autumn foliage, fallen leaves which have spread across the sidewalks and awning, benches for additional outdoor seating, trash cans, a bicycle rack with one bicycle parked [probably a café employee's bicycle] in the back, and a drain pipe along the back of the building. 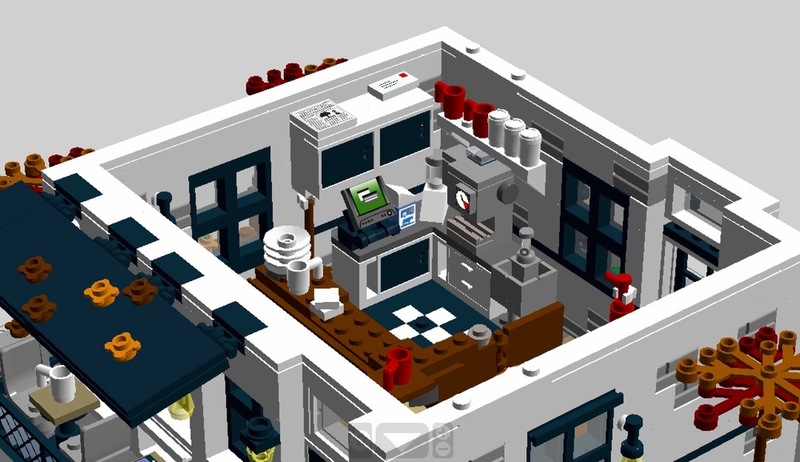 The interior of the design is packed with all of the café staples, such as a serving area complete with cupboards, drawers, a cash register, espresso machine, blender, sink, and broom for cleaning. There is a seating area with three tables and a number of chairs, and a newspaper rack for anyone wishing to purchase a paper or simply read one while they savor their beverage. A shelving unit filled with café merchandise [primarily mugs] sits in the back right-hand corner of the café for those wanting to take a piece of the café home with them. Of course, there is also a wall clock just above the newspaper rack so that the café patrons can casually watch the hours tick by while they forget their worries within this cozy and charming local café - a café which has clearly been a well-beloved fixture in the town for quite some time now. 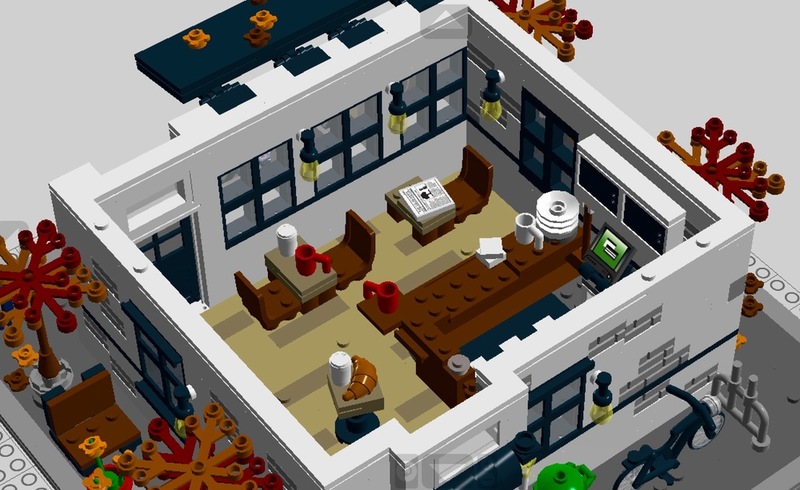 The total piece-count for the set is a little over 1,600 pieces, and the entire model is 10"x10"x5" [built upon a light bluish gray 32x32 baseplate]. I have recently sourced the parts for the build, and built a tangible model of the design as well. 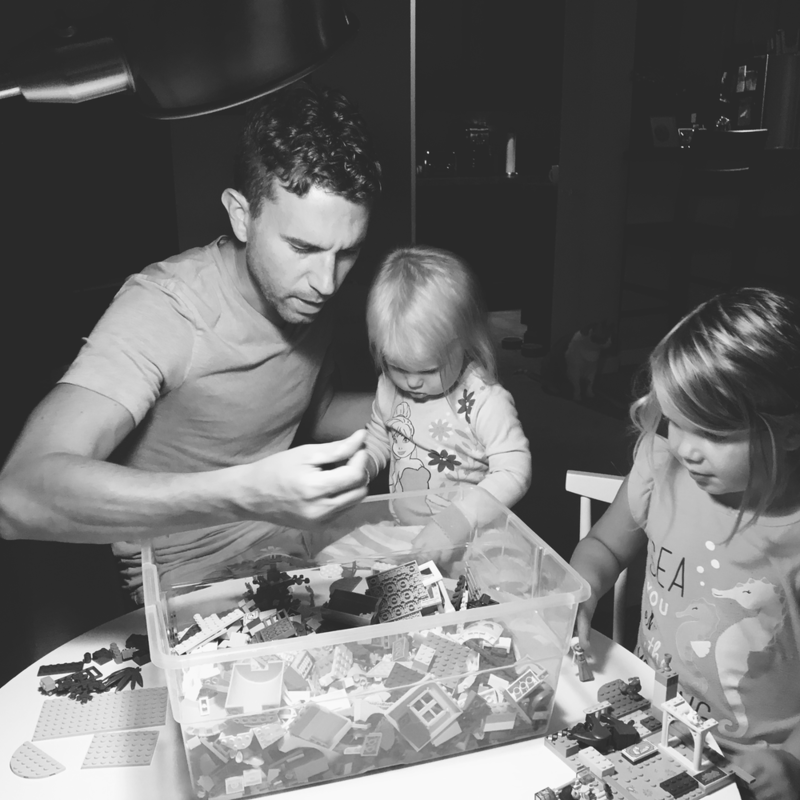 You can check out photographs of the fully built model on my latest project post. 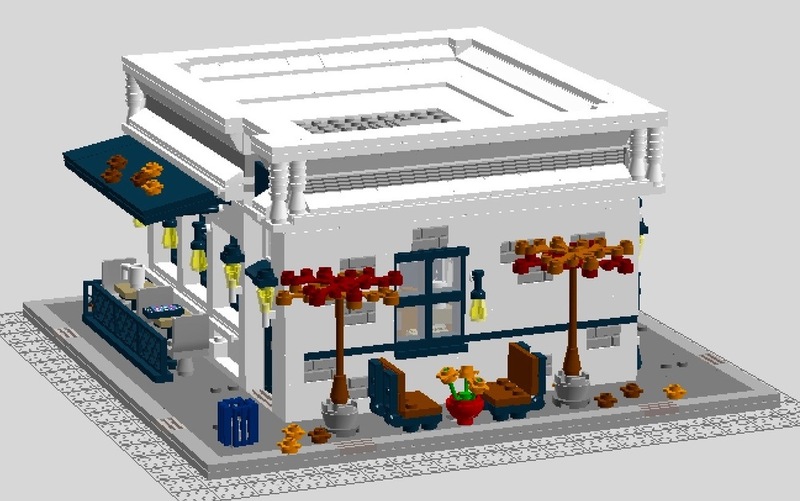 I have also since posted the project to LEGO Ideas, so if you enjoy Autumn Café, please visit the project on LEGO Ideas and provide your support. Every supporter counts! Thank you in advance for your support and/or criticism. What do you think about Autumn Café? Please leave a comment below and let me know your thoughts. Your input is highly valued. Thanks in advance for any input you may have.